We check out the top 10 DJ controllers for beginners and run through each of their features. Feedback tells us that our number 10 is by far the most popular, but which will you choose? There's so much selection when it comes to DJ controllers, and knowing which one to buy can be difficult for beginners. To make things easier for you I've put together a list of the top 10 DJ controllers for beginners. Before you buy a controller you should know exactly what type of DJing you want to do. Every controller has something different to offer so this is important. For example, some controllers require a computer to operate. You link the two using the USB ports, and then use software to select your music. Or you could get a stand alone, all-in-one controller. This will not require a computer, instead you can play music from USB devices, and sometimes CD's. If you're going to be doing most of your DJing at home you might find that using a controller with a computer is fine. But if you are an aspiring mobile DJ that will be gigging you may think twice. Do you really want to take your brand new Macbook Pro to a bar full of sweaty ravers? Hell no! Other things to consider are things like built in effects, microphone inputs, terminals to link up turntables/multi players etc. And remember, in a few months you could have the basics of DJing mastered. So do you want a controller with a few extra features that can grow with you? There are lots of things to consider, so we'll list all of the stand out features of each DJ controller to help you decide. This list of the top 10 DJ controllers for beginners is in no particular order. I've either owned, demoed, or reviewed eight of the controllers listed to give a true opinion on the controllers. The other two are based on popularity, amazon reviews, and feedback personally voiced to me by owners. You will know the best possible controller options available after reading this list. The Pioneer DDJ-SB2 is a beginner friendly controller that will be used in conjunction with a computer/laptop. It's not going to overwhelm you with more buttons than you can fathom, but there's still enough features to keep you busy after learning the basics. The DDJ-SB2 is mapped to work perfectly in conjunction with Serato DJ Pro software. The controller comes with the free version of the software called Serato lite, but it's very limited in its features. So if you buy this controller expect to purchase an upgrade to the full version. See here for more on the Serato DJ pro at their website. The mixer section offers a 3 band EQ and VU meters to help you to learn the important art of EQ mixing. You'll also see a library browse knob with two load buttons. This lets you search for a track in the software library and select it without using your computers mouse or track pad. This takes a little stress away as a beginner, as you won't have to keep messing with the software. Another cool feature for beginners is the filter fade that can be turned on with a simple button as you mix. The filter fade will add two high pass filters to the crossfader. This will help to hide any little mistakes that we all make as beginners, and it also sounds really cool. As you progress you can use the high/low pass filter knobs instead to do a more creative job of filtering. The DDJ-SB2 is a 2 channel controller, but you'll notice switches on the deck section to switch the channels over to another source. This means you can control up to four decks at a time using the software. Over on the deck section there are two lovely chunky 128 mm aluminium jog wheels. These are touch sensitive and can be used for cueing, beat nudging, and scratching. Some lesser controllers can be a little laggy when releasing the jog wheels but the DDJ-SB2 is very responsive. Up above the jogs you'll see the rather short pitch faders for manual beatmatching. I've never got along with small pitch faders and for me this is one of the DDJ-SB2's pitfalls. But with that being said, I learned to DJ with long faders.. So it may just be down to personal preference. Below the jog wheel there are 8 large pads, 4 of these are for basic functions like play/pause, cue, sync, and shift. But the other four are true performance pads that let you add hot cues, loops, auto loops, and you can even throw in samples. Last but definitely not least is the FX section. There are no built in effects, so the effects will be assigned to these buttons using the software. Serato has a massive bank of effects and you can even get add-ons so you'll have lots to choose from. Once the effect is active you can then control its parameters with the level/beats knob. The Pioneer DDJ-SB2 has become a very popular choice with beginners and intermediate DJ's. Overall this is a controller that will certainly grow with any beginner. Once you combine software into DJing you are opening a ton of possibilities, and Serato DJ Pro is one of the best. With a great price tag and decent build quality beginners should be more than happy with this controller. Next up on the list of the top 10 DJ controllers for beginners is the Pioneer DJ DDJ-RB. You'll notice how similar it looks to the DDJ-SB2, and in some ways it is, but it also has some unique features. First off, this controller is not mapped to Serato DJ. Instead the DDJ-RB works alongside Rekordbox DJ software, which is Pioneers own program. Rekordbox is suitable for beginners and will offer you more than enough features without being too overwhelming. The basic layout of the DDJ-RB mixer section remains the same but is loses the filter fade option. Not to worry though as it still has high/low pass filter knobs on each channel which are always handy and fun to use during the mix. The deck section looks very similar until you look a little closer. You'll notice the FX section is a little different, this time offering a single FX button with a beat button and full parameter adjustment knob. This seems a little disappointing after seeing the FX section on the DDJ-SB2 until you check out the pad section. This time you get a full set of 8 performance pads per deck as opposed to 4 on the DDJ-SB2. If you like the idea of performance mixing this will definitely appeal to you. These pads let you control hot cues, Pad FX, Slicer, and Rekordbox DJ’s own Sampler. So you'll be able to get super creative and learn the skills needed for complex routines. You'll notice the play/pause, sync, and shift buttons are now to the left, out of the way of the performance pad section. The jog wheels remain super chunky and perfect for scratch routines, but Pioneer have done away with the polished aluminium finish. The pitch sliders are still a little small for my liking but it is possible to get your beats matched manually. Overall a good beginners controller that could grow with you as you learn performance mixing and controllerism. See my full review HERE. Next up and my third choice on the list of the top 10 DJ controllers for beginners list is an all-in-one unit.. The Numark MixDeck Express is a little different to the previous controllers as it has the ability to operate as a stand alone unit. This means you can plug it into a power source, connect some active speakers and begin mixing. You won't need a laptop, but if you would like to use it with software this is also possible. You can plug in a USB device such as a thumb drive, mix from CD's, or of course a computer. If you don't want to risk taking an expensive laptop along to a gig the MixDeck Express could be a great option. This could make it a good choice for mobile or house party DJ's. Something else that will appeal to aspiring mobile DJ's is the microphone inputs. Firstly there is a microphone input located on the front of the unit. This has its own 2 band EQ and volume control. But there is a second microphone input on the rear that is controlled by the third (centre) channel. So you'll have a 3 band EQ, gain, and a line fader to use on the microphone! This third channel can also be used for and aux input by switching it over at the top. So you could plug in a separate audio source like a phone or an effects machine. Unfortunately there are no built-in effects available with this unit so you would have to link up an effects machine to the aux input. Or you could plug it into a laptop and trigger them with the software. Not ideal if you like the idea of playing with effects and triggering them with the hardware. So this may only appeal to DJ's that don't need the latest tech and geeky functions. The jog wheels are very nice, they're big, touch sensitive, and can be used in scratch mode. This means you'll be able to cue the beat, scratch, and spinback the track. Or with scratch mode disengaged the jog can be used for pitch bending to help with beatmatching. The CD players have a slot drive rather than trays which is great to avoid damage, they also load very fast. You'll have a full display of your track information in the digital readout, and BPM counters. A pitfall is that there's no waveforms on the digital readout to see a view of your tracks breaks etc. So if you don't know your tracks very well you may struggle with mixing them. Overall this is a good unit, aimed at the beginner/budget mobile DJ. 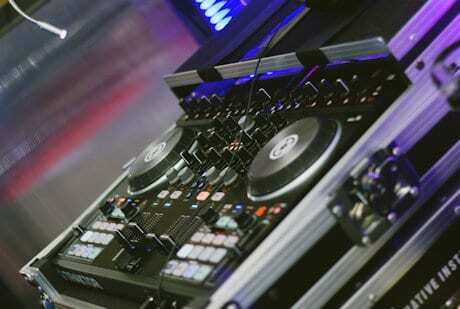 It's very basic and will cater for the basic needs of a DJ. If you want a cheap, good value all-in-one controller, that doesn't have all the flashy modern tech, this could be for you! The DJ-202 is Roland's entry level DJ controller that packs plenty of features for beginners, and at a great price. This controller will be used in conjunction with a laptop and comes with the Serato DJ lite software. As we mentioned earlier, Serato DJ lite is very basic so expect to pay a little extra after purchase for the full software. The mixer section offers a nice basic layout with two channels that can control up to four decks. Simply drop tracks on to the third and fourth deck in Serato and switch the controller over for full control. This won't be a function to mess with as a beginner, but it means the controller can grow with you. There are trims, and 3 band total kill EQ with filters on both channels to help you create smooth mixes. And at the top of the mixer section there's a library search knob with load buttons. This lets you load your tracks without dragging and dropping via the software. The sequencer controls in the centre are used to activate and control the DJ-202's built-in drum kit. Using the performance pads you'll be able to trigger some of the drums that Roland made famous. There are drum kits from the TR-909, 808, 707, and the 606 machines with eight sounds in each. These are super fun, and you don't have to have a track assigned to the controller to use them. Using the performance pads you can also set loops and hot cues, and you can throw in samples which are chosen inside Serato. Up above there are two large touch sensitive jog wheels that aspiring turntablists will love. They're a little heavier than the usual jog wheels you find on basic controllers, but they're nice. You can scratch, cue, spinback and all that good stuff, and you can also use them in slip mode for pitch bending. At the top there's an FX section that lets you control effects that are chosen inside the Serato software. Here you can add up to three effects at a time and have full control of their parameters. Two little pitfalls are the small pitch faders which I always dislike. As you've noticed by now these are pretty standard on basic controllers. They work OK but it's always going to be harder to beatmatch with shorter faders. Secondly is the full plastic shell, which is good for weight saving, but it makes it prone to damage. Mobile DJ's should be aware of this, and it would be advisable to buy a carry case to protect the unit while transporting. If you're just using this at home the plastic shell shouldn't be a problem. So overall a nice controller, well suited to beginners that would like some extra goodies to play with. And it comes in at a great price considering all of its features. 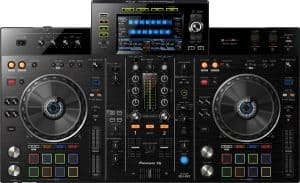 Pioneer are certainly dominating the top 10 DJ controllers for beginners list, and they're now back for a third appearance. The Pioneer DDJ-SB3 is an upgrade of the super popular DDJ-SB2, and they've even collaborated with Jazzy Jeff! The controller is still built to work perfectly alongside Serato DJ and comes with the lite version of the software. It comes in at an incredible price and gives you a lot for your money. The basic layout remains the same, but Pioneer have tried to make the DDJ-SB3 more user friendly. This time Pioneer have moved the transport functions to give way to two extra performance pads per deck. So the DDJ-SB3 now follows the rest of the DDJ family with play/pause, and cue buttons on the bottom left. And they've also moved the sync and shift buttons to free-up another two pads to add essential functions. There's now a dedicated auto loop section with in/out buttons to make looping much more simple for beginners. The auto loop function on the SB2 was located on the performance pads, this has been replaced with FX fade. The FX fade has replaced the filter fade function from the SB2 and creates a very similar effect. Fx fade lets you drop in an effect while reducing the main volume at the same time. This is great for smooth mix transitions and makes mixing less stressful for beginners. DJ's that play a wide variety of genres in the same set will also appreciate the FX fade. It will make clashing vocal mixes sound super clean and even help to cover up beats that aren't perfectly matched. Pioneer have really focused on scratching with this controller and have added the pad scratch mode. This has been produced in partnership with scratch legend DJ Jazzy Jeff. The purpose of pad scratch is to encourage DJ's to learn the art of scratching. When you press a performance pad in pad scratch mode you'll hear a scratch sound. The scratch sound has been created by Jazzy Jeff and will sync perfectly to the beat of your current track. All you have to do is replicate the sound! Obviously these scratch sounds can be dropped in like a sample to make you sound better than you actually are. But that really isn't the purpose of pad scratch, it's a learning tool that could really help aspiring scratch DJ's. Overall the Pioneer DDJ-SB3 is a great controller aimed specifically at beginner DJ's. It's certainly a good upgrade from the SB2, but DJ's will still have their favourite, hence including them both in this list. The Numark mixtrack pro 3 comes in at an amazing price making it very popular as a start-up unit. 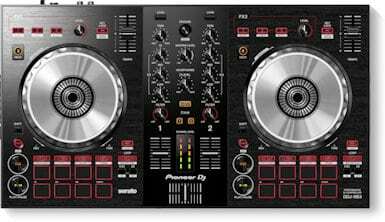 Its clean and basic layout appeals to beginners that want a simple controller to learn the basics of DJing. The controller is bundled with Serato DJ lite to get you off to a start. But bare in mind that you'll need an upgrade to Serato DJ Pro for the full functions. Or you could use the controller with free software like Mixxx! The first thing I noticed about the Mixtrack Pro 3 is the long pitch sliders which are unusual on basic controllers. As previously mentioned I have never enjoyed beatmatching with short sliders, so these are perfect. The first time I used this controller I had no problems getting the mix perfectly beatmatched with the 100mm sliders. Something else usually seen on higher priced units is the touch strip along the top of the deck section. This is really cool and is known as the strip search. By sliding your finger along the strip you can control the parameters of effects that have been chosen in the software. These effects are assigned to the buttons below the strip. You can also use the strip while holding shift to easily scan through the track currently on that deck. Another stand out feature are the shiny metal jog wheels, these are pretty big for a small controller at 128mm. They're very responsive and are great for scratching, they also work great alongside Serato DJ Pro. Once you've mastered the art of beatmatching and mixing, the performance pads will keep you busy. You can add loops, auto loops, cue points, and you can even assign samples to spice up your DJ sets. This is great for beginners as it gives you something to progress towards after mastering the basics. This is a nice basic controller with an easy learning curve that will not overwhelm beginners. But it still has plenty to offer which will ensure you won't outgrow it to quickly. I have a full review looking into every feature of the Numark Mixtrack Pro 3 HERE. This funky little controller comes in at an amazing price considering what's on offer. If you look at the reviews on Amazon you'll see that it has left a very good impression since its launch. It's not as pleasing to the eye as some of the previous controllers on this list, but that may be a good thing.. By using smaller buttons allowed Behringer to fit a lot more features onto a smaller unit. It comes with Deckadance 2 software to get you mixing out of the box. It's also compatible with a wide range of other software including Serato DJ Pro, Virtual DJ, and Traktor Pro. And it offers simple plug and play function for even quicker set-up. This is achieved via the big 24 bit sound card which will give crystal clear audio playback. Straight away you notice the long pitch sliders which are a great feature to see on cheaper basic controllers. This makes beatmatching so much easier than using small sliders and is just what a beginner controller needs. It also has much longer than normal volume faders, this will give more control over your mixing. As you look closer you notice just how many features this little controller packs. You can add 8 hot cues per deck and create loops with the dedicated loop section. It also has a dedicated FX panel to assign FX via the software and allows full control over their parameters. And you can even control up to four decks from your chosen software! If this sound complicated to you now, don't worry as this controller will grow with you. Once you master the basics you'll be able to start incorporating one more function at a time. The jog wheels are a decent size and they are touch sensitive so you can scratch, cue, and backspin. They feel nice and free and not to weighty, and with the shiny finish they look really cool too! The Behringer CMD studio 4A comes with a three year warranty to back up Behringers claims that this unit is built to last. It's a great option for any beginner, or with it's many features even DJ's moving up the ladder. And it comes in at an incredible price! There's only three controllers left to see on the list of the top ten DJ controllers for beginners, but we have three more fantastic options. The last three options will be more feature packed controllers for beginners that want something that will grow with them and to last a long time. The Reloop beatpad-2 has been built specifically for Mac, iOS & Android users. Most people have a tablet these days so this could be a cheaper way for you to begin DJing. It's very feature packed but still simple enough for beginners to get to grips with the basics. Once the basics are mastered the controller will have much more to offer you. This controller is a long term investment that features an intuitive design that will grow with beginners. This controller could keep you learning for many years. The controller is made to work perfectly in combination with Algoriddim's DJAY 2.5 software. This can be downloaded to your device for a simple plug and plug function. It's also applicable as controller for PC/laptop by using the built in USB interface. If you're using a laptop the beatpad-2 can also be mapped to work with Traktor Pro 2 and Virtual DJ software. The Reloop Beatpad-2 has those nice long pitch faders that you know I love, for simple and accurate beatmatching. It's well lit for DJing in dark venues and even has lights that scan around the jog wheels as you play. This gives a kind of virtual needle effect and looks awesome as you mix. The jog wheels are super responsive and are perfect for scratching and general mixing. I can also really appreciate the small things that give this controller character. There's a nice vinyl effect with metal centres on the jogs, multicolored pads and buttons, and a sleek layout. The performance pads are multi function offering you a massive amount of options so you'll never get bored. You can add hot cues, loops, auto loops, FX, samples, and more! These are professional level features built into a simple beginner friendly controller. I mentioned earlier that this is a long term investment as it's a higher priced unit, but it still offers great value. The build quality is top quality and it should bring you many years of DJing fun. This will suit beginners because of the simple layout, but more experienced DJ's will also appreciate it's many features. If you want a controller that can grow with you, so you can avoid buying twice, this may be the one for you! When you look at the the MC4000 you'll soon see that it's been designed with mobile DJ's in mind. It's the first controller we've seen on the top 10 DJ controllers for beginners list specifically aimed at working DJ's. It's a feature packed controller that's also more than suitable for beginner bedroom DJ's. It offers many features to keep your audience guessing, and is small enough to easily transport to your gigs. It's available at a great price, and is a great investment for serious beginner DJ's. 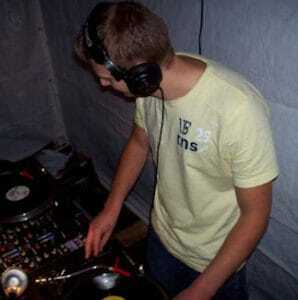 It will show you the ropes and then grow with you as you progress as a DJ. It's designed to work perfectly alongside Serato DJ and comes with the Lite version of the software. If I was just starting out and had this list of the top 10 DJ controllers for beginners, this would be my to choice. The layout's simple enough for beginners to learn the foundations of DJing with big jog wheels and long pitch faders. Once the basics are mastered the controller will really come into its own. Aspiring mobile DJ's will be happy to see two microphone inputs. These have a talk-over function to drop the volume as you speak, and you can add echo for a professional sounding effect. It also has booth outputs that are important for mobile DJ's to add monitors. And a dedicated sampler, looping, and FX section for spicing up the party. It also has a censor button for blocking out those naughty words when DJing kids birthday parties etc. It also stays true to Denons reputation for quality sound reproduction with its built in 24 bit sound card. This gives crisp and clear audio playback for a better listener experience. I've tested this unit and you really can hear the difference after mixing on lesser DJ controllers. It's clear that this controller has been aimed specifically at mobile DJ's. The Denon MC-4000 will appeal to you whether you're a beginner or not. This is a controller that will grow with beginners, but will also be appreciated by more experienced DJ's. If you're just starting out and have your sights set on mobile DJing, this is the perfect option. It's very durable with its metal construction, and very portable for travelling to your gigs. This controller is a little different from what we've seen previously in this list. First off, it's built by Native instruments and is purpose built to work perfectly with their software. It will work with Traktor pro on a PC/Mac, or you can download Traktor DJ to link it up to your iPad/iPhone. If you do decide to use iOS, your device will also charge as you are mixing. This means you could easily do a full gig using just the Traktor Kontrol S2 and your iPad/iPhone! There's FX control so you can assign any effect from the Traktor software and control their parameters. And on the mixer section you can also control Traktor's remix decks. But you can only use the remix decks if you are using it via a PC/Mac. Remix decks are separate decks inside the software that contain lots of different sounds, samples, and loops. You can trigger each one individually to add a different flavour to tracks that you play. So this is yet another attractive quality for performance DJ's. The mixer section is minimal but gives you everything you need, along with a nice loose crossfader and tight channel faders. The jog wheels work great and are very finely-calibrated for precise cueing and scratching. And as you guessed by now, I love the pitch sliders simply because they have plenty of travel. As mentioned earlier, this is important for beginners to learn the ever important skill of beatmatching. Perhaps performance mixing? You could even plug in a Traktor Kontrol F1 to give you more control over the remix decks. Lots of things scream performance mixing when looking at the Traktor Kontrol S2, and the video below shows off some of these features. Thanks for checking out this list of the top 10 DJ controllers for beginners. Every option on this list was chosen very carefully, you can rest assured that you now know the top choices out there! If I was to start again from scratch I'd do anything for a list like this to help me out. Now all you have to do is boil it down to the one that really stands out and ticks all of your boxes. Let me know which one you chose! If you need help with mixing check out my article on mixing > HERE. This is by far the fastest route to learning all you need to know about DJing!